RELATION is a peer-reviewed book series intended to advance the study of the multifaceted relationships between media and society by emphasizing the comparative dimensions of such research. Monographs, collection of articles, conference proceedings, or edited source material are published in this series. 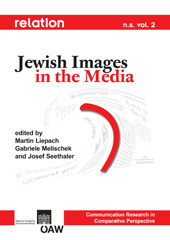 This volume is devoted to Jewish images as portrayed in Western media - using both historical and contemporary contexts as well as multidisciplinary perspectives. It is composed of two parts. While the first part "(Re)Producing Images and Stereotypes" is dedicated to articles exploring the use of images and stereotypes in the media discourse, the second part "Dealing with Stereotypes and Antisemitism" focuses, additionally or exclusively, on the media´s reactions to stereotypes, and reactions to antisemitism. Sixteen authors present studies that apply either a comparative approach to the subject matter or provide results that should be discussed in relation to findings of other analyses presented in this book.